My favorite crime fiction paperback cover? 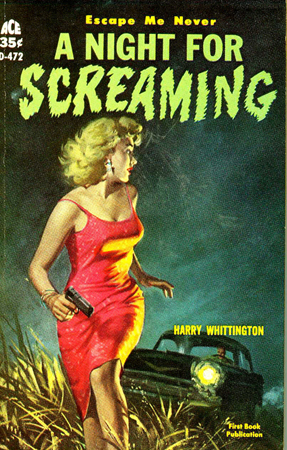 It’s hard to choose one among hundreds, but I’ll go with the cover for the Ace edition of Harry Whittington’s A Night for Screaming (Ace Books, 1960). 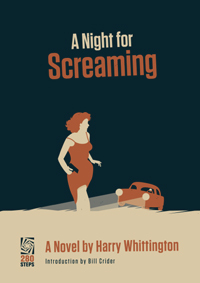 Whittington is one of my favorite paperback writers, and A Night for Screaming is the first of his books I read. I was in The Book Stall, way out on Burnet Road in Austin, Texas, when I spotted it on the shelf. It’s a cover that grabs the eye: the fleeing woman in the foreground, the tight red dress, the pistol in her hand, the pursuing car, the agitated lettering on the word “SCREAMING.” What’s a woman dressed like that doing in that field? Who’s the driver in the car? Why is he chasing her? Will he catch her? Will she use the automatic she’s holding? Best of all, the book delivers a lively story to match the kinetic cover that caused me to pick it up. I’ve been a Whittington fan ever since. Ex-cop Mitch Walker is on the run after being wrongfully accused of murder. So Walker hops a train and ends up in a small town in Kansas, where he signs up to work at a huge farm owned by Barton M. Cassel, the big man in the county. The farm looks like a good place to hide from Fred Palmer, his pursuer and former partner, and the local cops, but Walker soon finds himself caught between the jealous battle of his new employer, and Cassel’s beautiful wife, Eve. And one way or the other, nobody leaves the farm.